In Vol. 5 of this series we address the techniques of wing closeouts and how to teach them within the principles of pressure man defense. 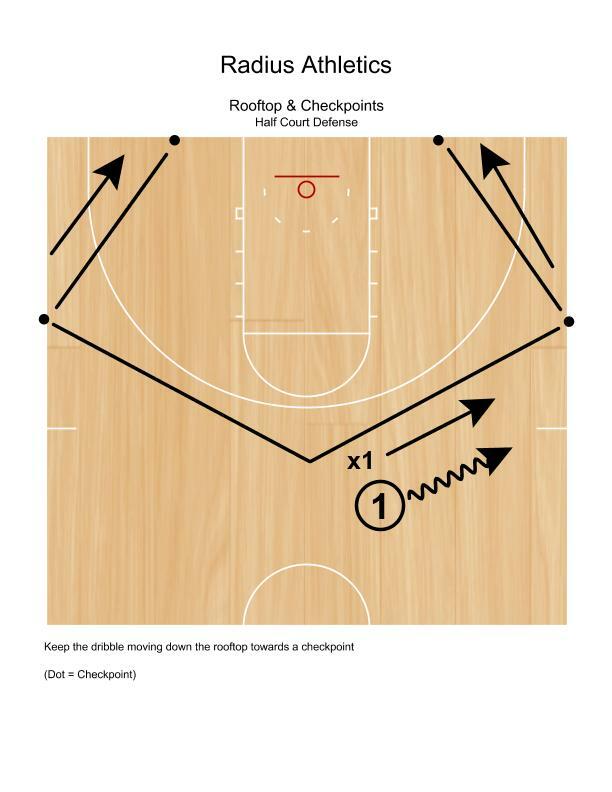 Most of the attention thus far in this series has been on the sideline checkpoint of the “Rooftop” principle. The stance angle when the ball is above the free throw line is key to preventing the kind of straight line drives that lead to easy baskets. When the ball is on the side of the floor and at or above the free throw line, the rooftop rules, stance angle and checkpoint all change. Closing out the wing and keeping the ball channeled towards the proper checkpoint requires practice. But the message to the on-ball defender is the same no matter the language: force to the baseline checkpoint. In the graphic below, you can see the location of the baseline checkpoint. It is a spot three to four feet off the lane line. Place a cone or tape an “X” on this spot during defensive drills to help develop stance angle. It should be noted that the on-ball wing defender does not “allow” or “give up” baseline. He/she makes every effort to angle any baseline attack to the checkpoint. Ideally the offensive player picks up their dribble or reverse pivots at the checkpoint. Influencing the ball handler to the baseline checkpoint, but not getting beat baseline allows the defense to remain intact and not go into rotation. Keep the language simple with your players. “Influence to the baseline checkpoint” conveys messages about stance, closeout angle and how to protect the middle of the defense. The all-purpose drill below was featured in an earlier entry into this series while discussing off the ball defense. But with an advancement, it is used for teaching wing closeouts as well. Players attempt to channel to the baseline checkpoint and force the ball handler to pick up their dribble or reverse pivot at the checkpoint. Should the on-the-ball defender get beat to the baseline, techniques for helping are drilled as well. Closing out on the side or wing can be drilled in many different ways, but the angles you teach and where you what to influence the ball should be a matter of philosophy that is a constant within your program.